The Trx is great core training tool women and men, and one of the best oblique exercises for women and men is side planks with your feet in the trx system. I know I've mentioned this in other places on this site, but I'll repeat it again before talking about the side plank. Oblique exercises will not magically get rid of love handles. Spot Reduction is the #1 Ab Exercise Myth. If you want to lose belly fat or get six pack abs you need to take a comprehensive approach to fitness and decrease your overall body fat percentage. Having said that, the obliques are super important for posture, supporting your lower back, strengthening your core, and improving sports performance. Tons of professional athletes use the trx, and you can benefit from it also. 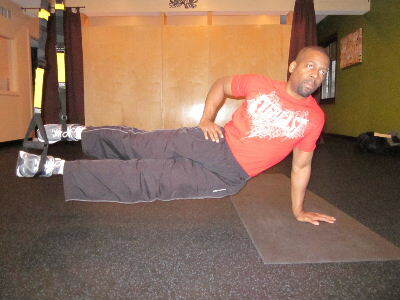 Below are pictures of the side plank from the hand. This exercise is much harder than the side plank from the elbow because it your hand is a much smaller base of support than your forearm and elbow. Starting position: Simply start by securing your feet in the trx straps. After securing your feet, place your hand on a mat and keep your hand right underneath your shoulder. Place your opposite hand on your hip. This is one of the hardest oblique exercises. If you go crazy with the reps the first time you do it, I guarantee that your sides will be sore for days! So go slow and build up slowly. 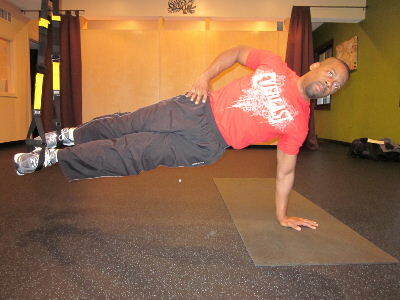 For many people 1 set of 10 reps is enough to make you sore the first time you try the trx. Aim for 5-15 repetitions and 1-3 sets. The starting position for the moving side plank is exactly the same as the isometric side plank above. The only difference is that you lower and lift your hips during the moving side plank. Personal Trainer Tips: If you're a beginner you should build up with regular side planks on the floor or bosu ball side planks. Once you have a good base of strength then try these more advanced exercises with the trx. Some of the best oblique exercises for women and men utilize the Trx, but the trx is just one tool to work your obliques. If you don't have access to a trx, check out all the other best oblique exercises for women and men.